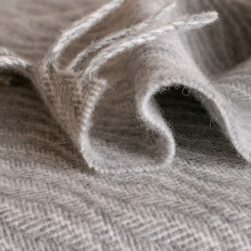 We’ve been spending the last few weeks weaving a new range of herringbone tweeds and replenishing stocks of our popular Silver Birch Herringbone. 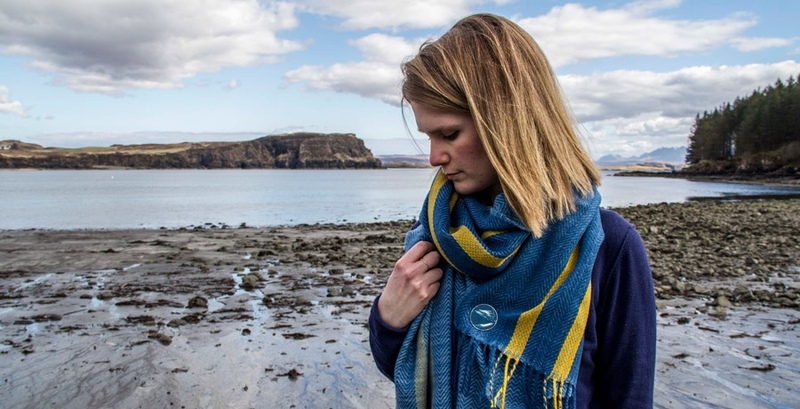 We enjoy weaving traditional herringbone tweeds with a variety of weft colours, which we choose by looking at the Skye’s stunning land- and seascapes. 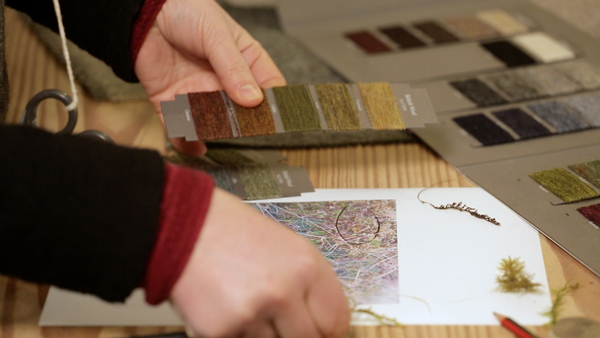 Follow our footsteps from tweed design to finished product in a short film made by the fantastic team of Skye Films. 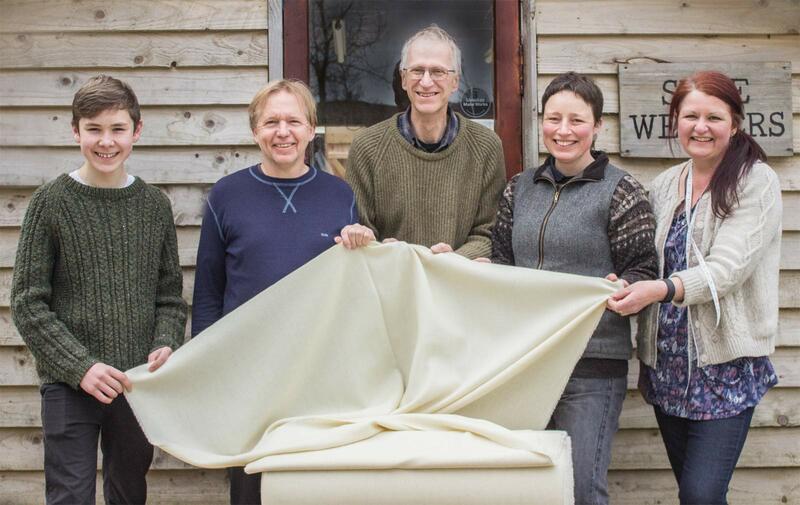 The tweed we were preparing while Skye Films made this short film about us, is our Moss Check Tweed. 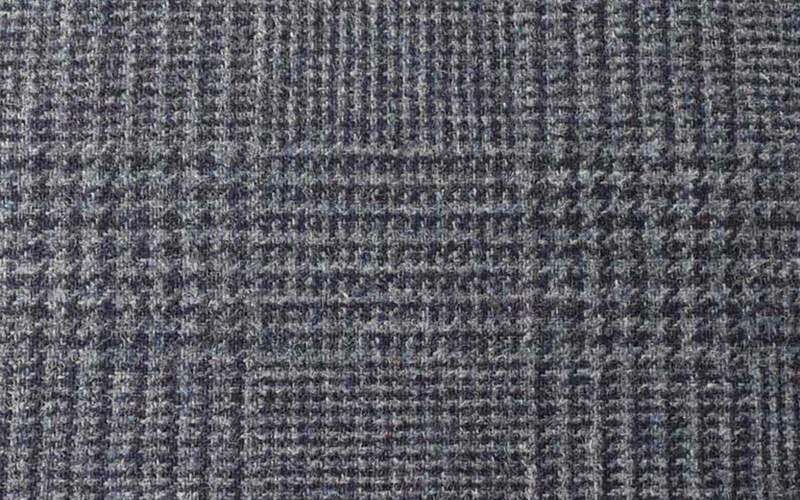 The yarn for this tweed comes from R. Gledhill Ltd, a long-standing family business of woollen yarn spinners. 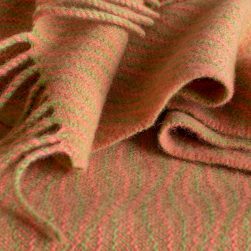 We have been working with them right from the start and really value the excellent quality of their yarns. 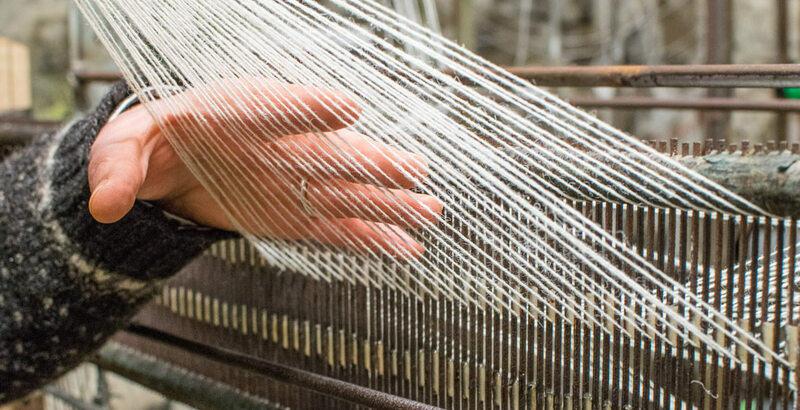 Once the weaving is completed, we send our tweed off to Schofield Dyers and Finishers in the Scottish Borders. 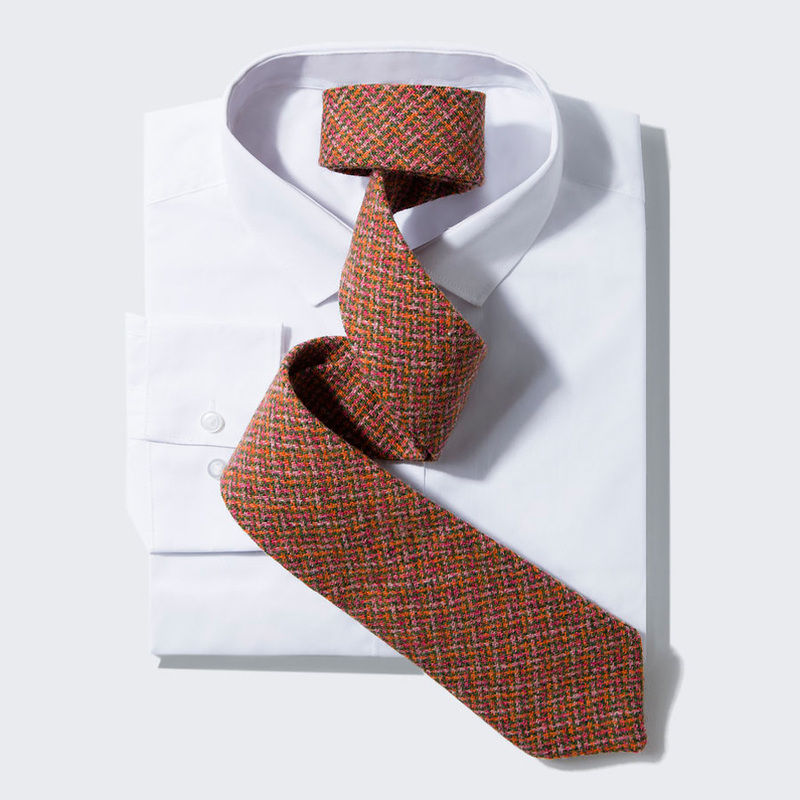 They wash and shrink the tweed, so it retains its shape even after years of wear. 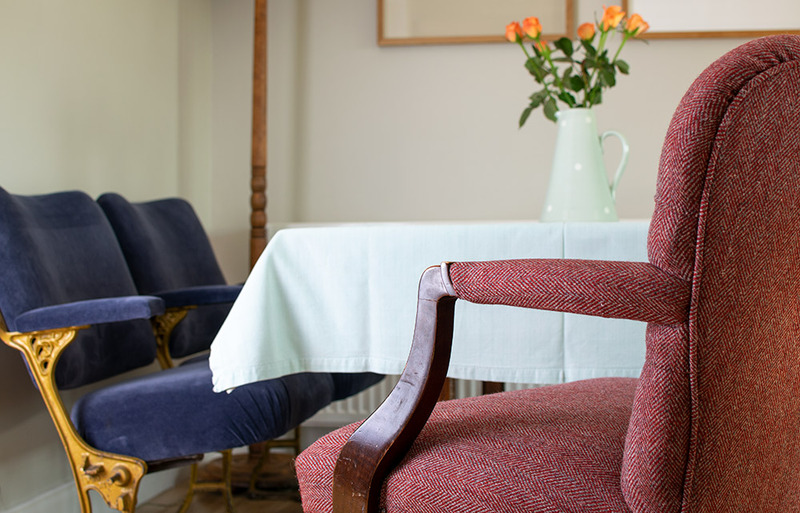 There are hundreds of different fabric finishes, which all create a slightly different effect and make the fabric suitable for its specified purpose. Visit Make Works, the Scottish Manufacturing Directory, if you would like to learn more. 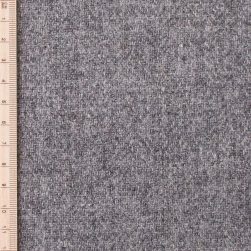 After finishing, the tweed comes back to us on Skye and we sell it by the length in our shop or online. 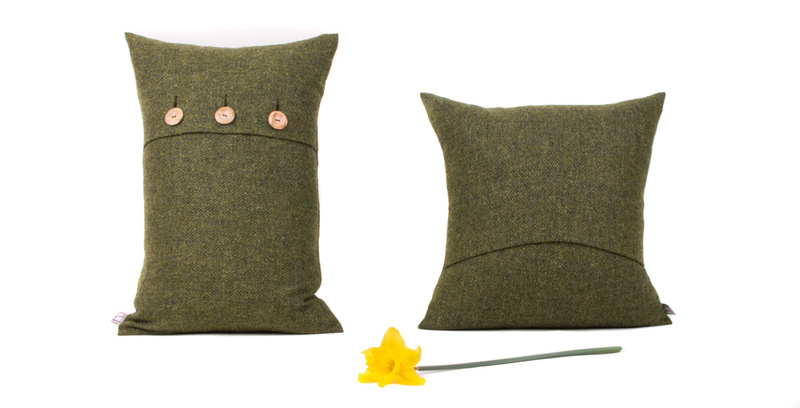 We also use it ourselves to make up a small range of clothing and homewares. 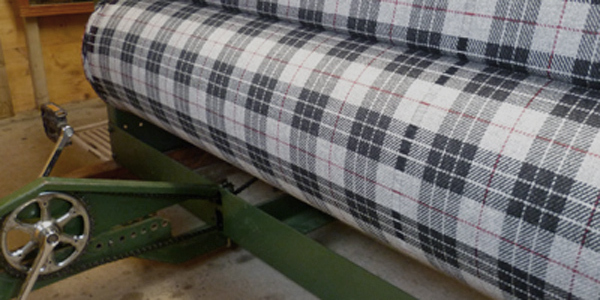 Our tweeds have been very popular for curtains and blinds. 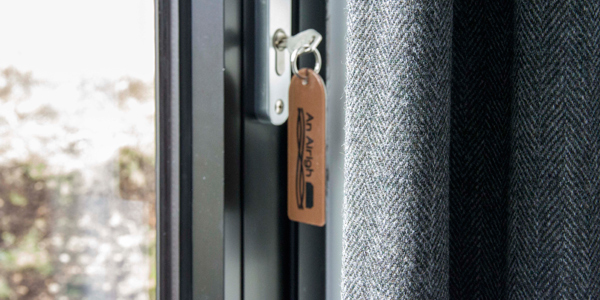 Here is a picture of a door curtain in An Airigh, an award-winning self catering holiday let over the hill from us. 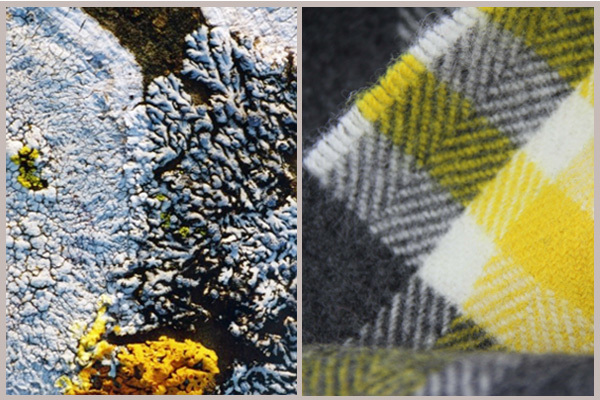 Last year we designed a tweed for an exhibition in the Inverness Museum and Art Gallery. 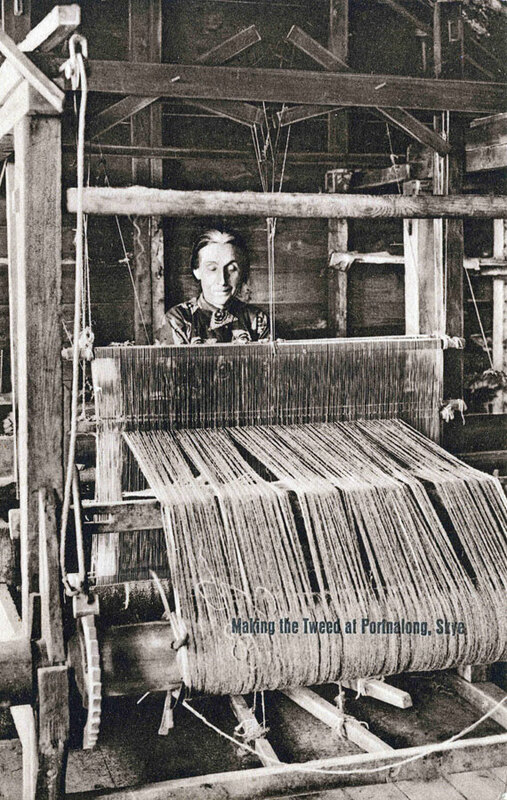 The aim of the exhibition was to explore arts and crafts connected to hunting, shooting and fishing. In the past these activities were essential life skills, and crafts developed around them to provide the perfect tool for the job. Today hunting, shooting or fishing in Scotland is not normally done for survival, but has mostly become a leisure activity. Still, a lot of the traditional tools are being used, and some of the crafts and skills are as relevant today as they were in the past. 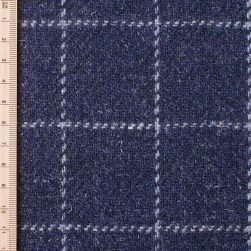 For a long time tweed was the fabric of choice in the Scottish Highlands and Islands not only for hunting, shooting and fishing. 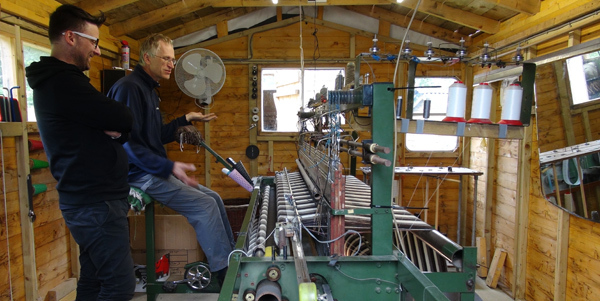 Wool was available and could be processed at home by anyone with a spinning wheel and a loom. 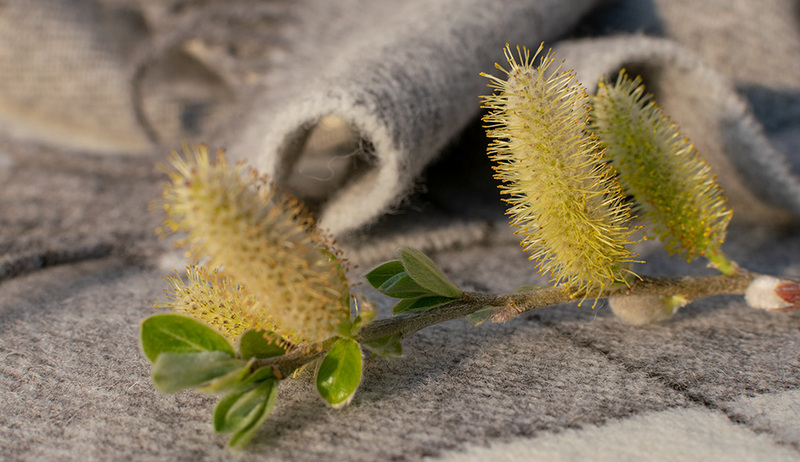 While the necessity to make your own fabric has gone now, natural fibres have come back into fashion. 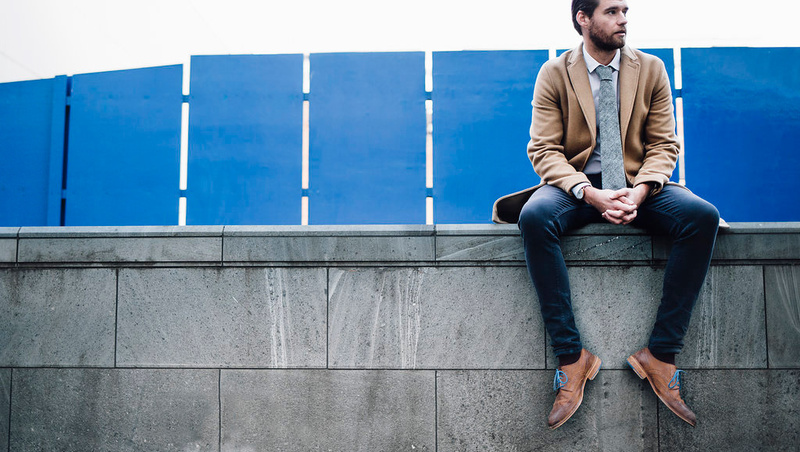 Wool is once again known about for its many great attributes – read more about it here: Campaign for Wool. 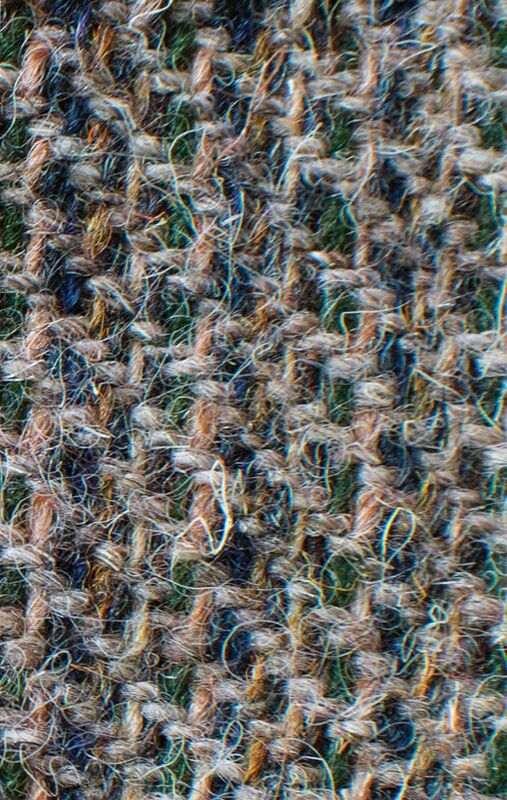 When we designed the tweed for the exhibition, we decided to weave a traditional herringbone fabric with a reference to the herring fishing around the shores of Scotland. Most of the herring fishing took place on the east coast, but Mallaig, Kyle and Portree were important fishing ports in the west. 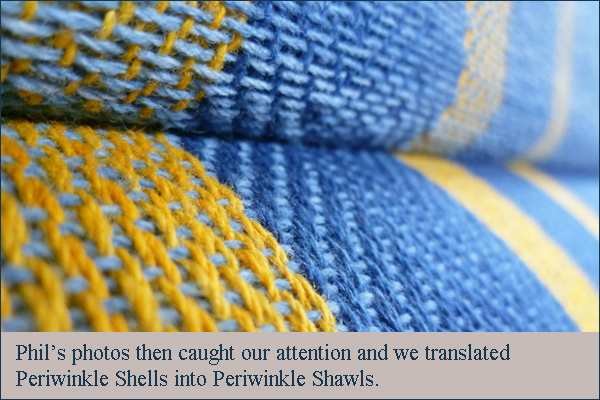 The yarn for our tweed was naturally dyed with Indigo by Tony and Eva of the Shilasdair Yarn Co. For us the herringbone in the two shades of blue represents a densely packed shoal of herring. The overcheck is a reference to the ring nets, which were often used for the herring fishing around here. Emma Dove and Mark Lyken of Soft Error produced a series of short films about objects shown in the exhibition. 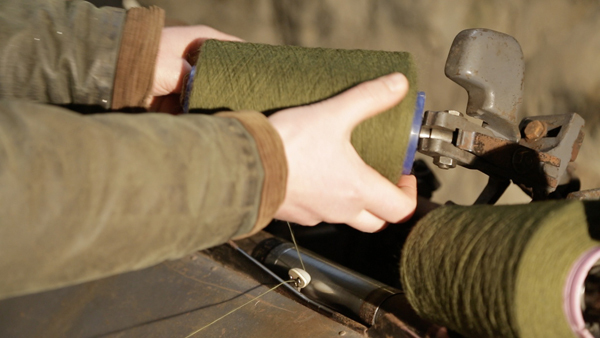 Here is the film about our tweed and the yarn dyeing: Indigo Herringbone Tweed. 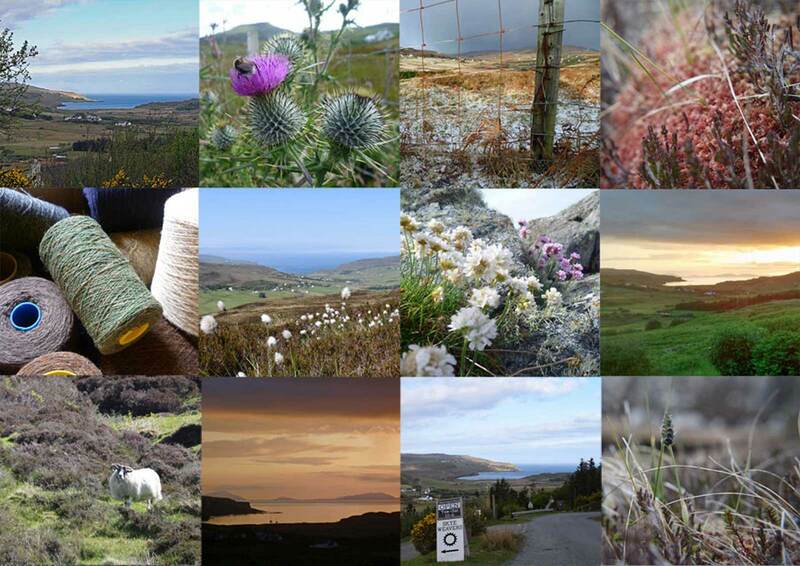 Get a taste of Skye! All online orders before the 5th of December will enter the draw for our small Skye Christmas Hamper. It’s got a taster of our favourite sweet, salty and soapy products made on the island. 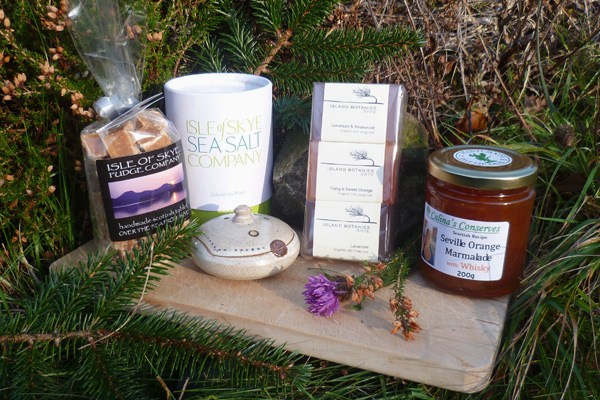 There is traditional Skye Fudge, award-winning Skye Sea Salt, a beautiful little salt pot, organic Island Botanics Soap and Whisky Marmelade. Most of these are also available online! 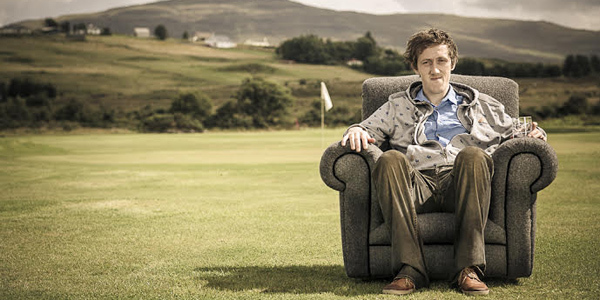 Kenny Macleod recently set up his own business Croft Upholstery. 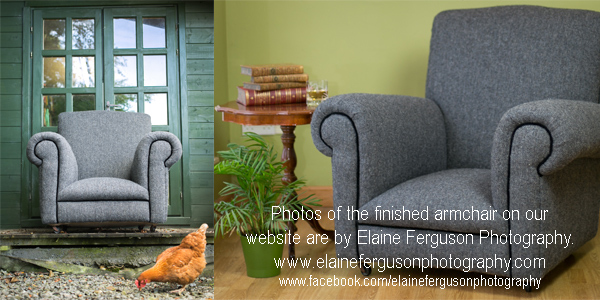 We have been working with him on a couple of upholstery projects since. 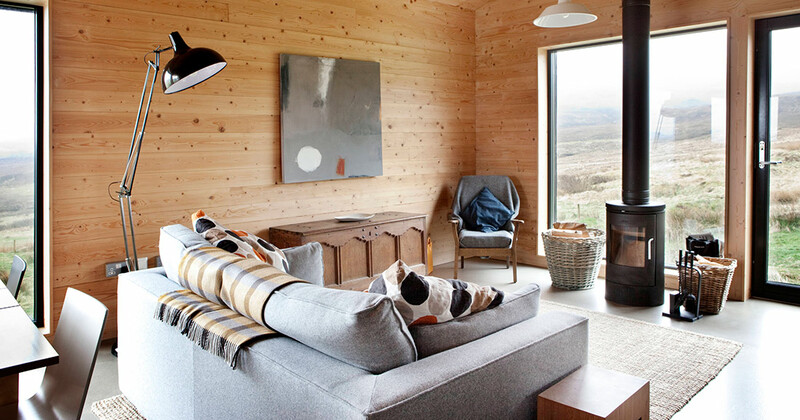 Here he explains how he learned his craft – from wood and springs to cosy armchair. 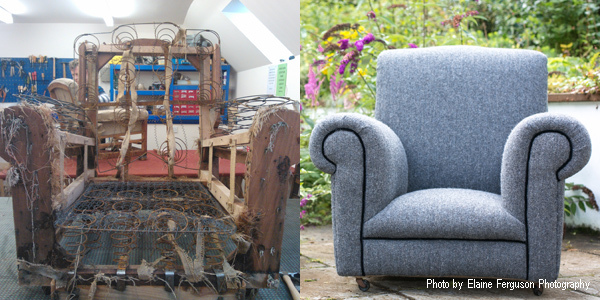 Croft Upholstery is a new upholstery and wood restoration service for Skye and Inverness. 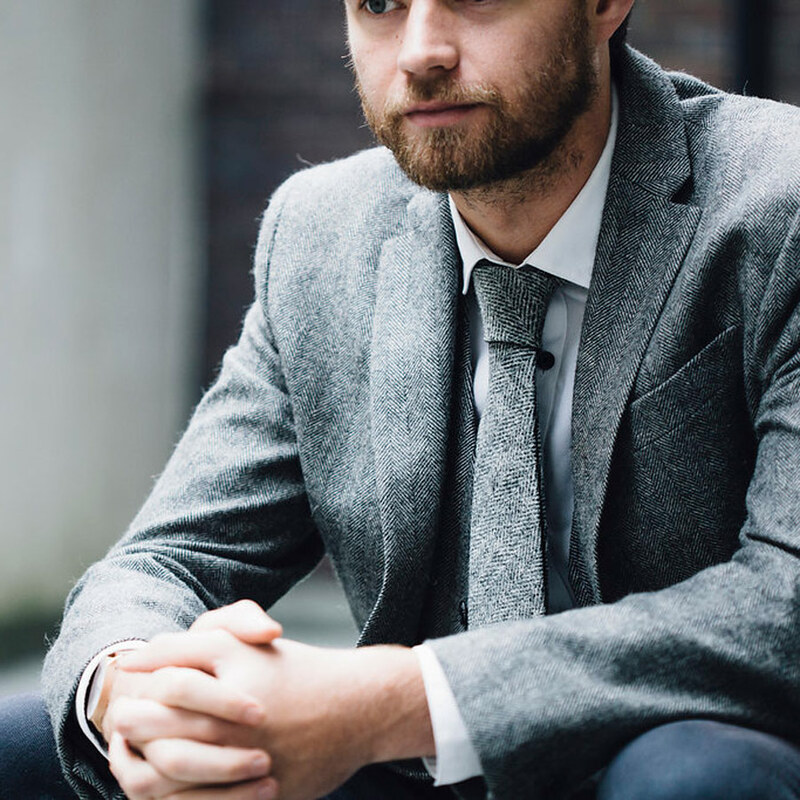 Since leaving School in 2001, I pursued a career in film and media, writing and consulting on scripts for films produced in Scotland and copywriting for STV Creative among others. Though it is a true passion of mine, I recognised that, from my experience, the media projects offered short term contracts and I really wanted to learn a skill I could practice to provide a dependable income. 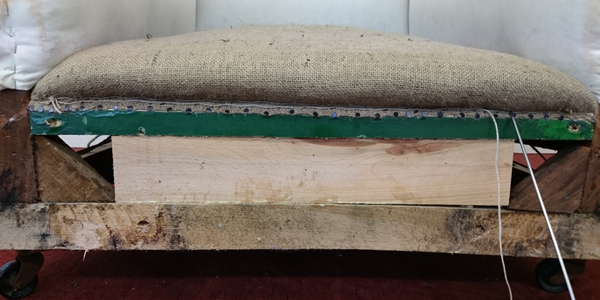 Upholstery is something I have been interested in since a young age. 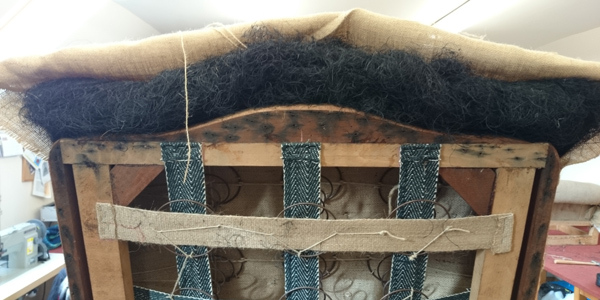 When I was a child, my mother used to get things upholstered by Bert Smith, whose role as the island’s sole upholsterer has not been filled since his passing a number of years ago. 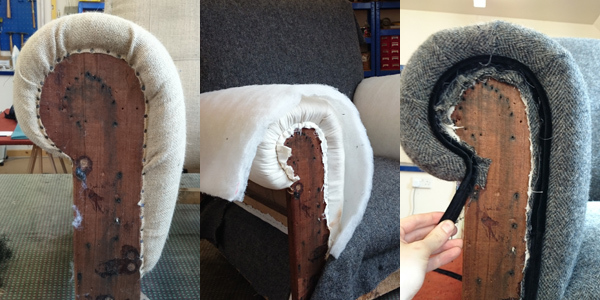 So, in 2012, I decided to explore my interest in upholstery and learn the craft. I trained with Fife’s Cornhill Courses from September 2012 until June 2014. Cornhill Courses is the only approved AMU training centre in Scotland. 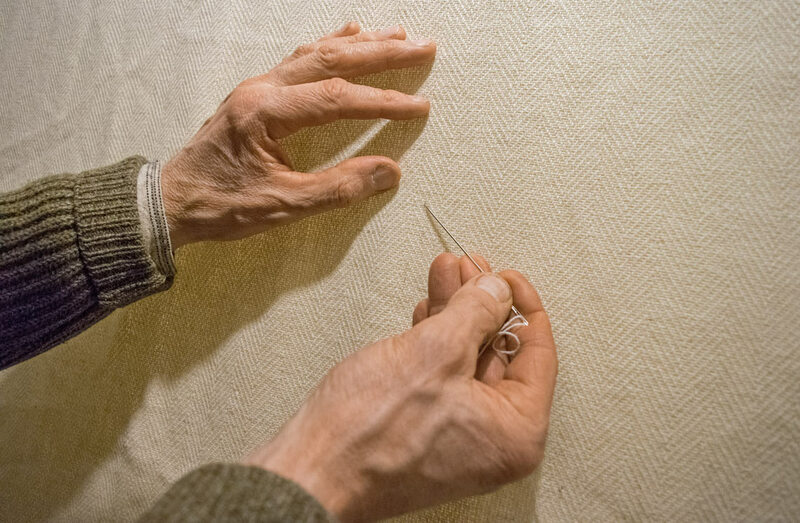 Completing level 2 and 3 certificates in traditional and modern upholstery techniques, I am now setting up as a self-employed upholsterer. In my opinion, collaborating with like-minded businesses is a really important part of growing a service within the Highlands. 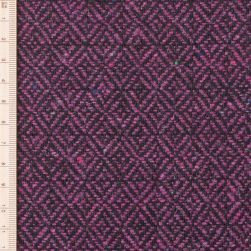 Last May, I got in touch with Skye Weavers as the tweed they make has a quality that I thought would be a perfect suit for my graduation piece. Checking and replacing spring units. 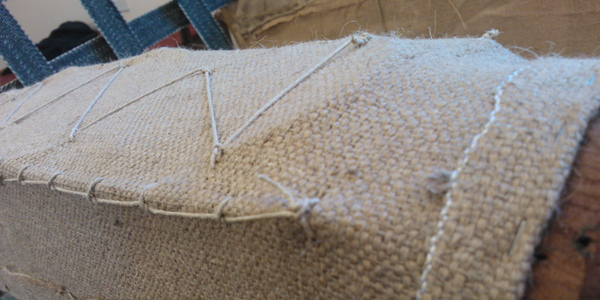 Blanket stitch applied to the length of the unit. 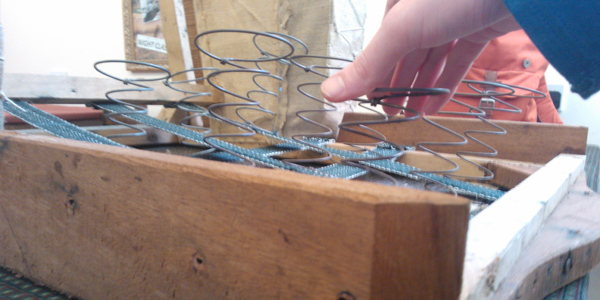 Sculpting the shape with scrim. 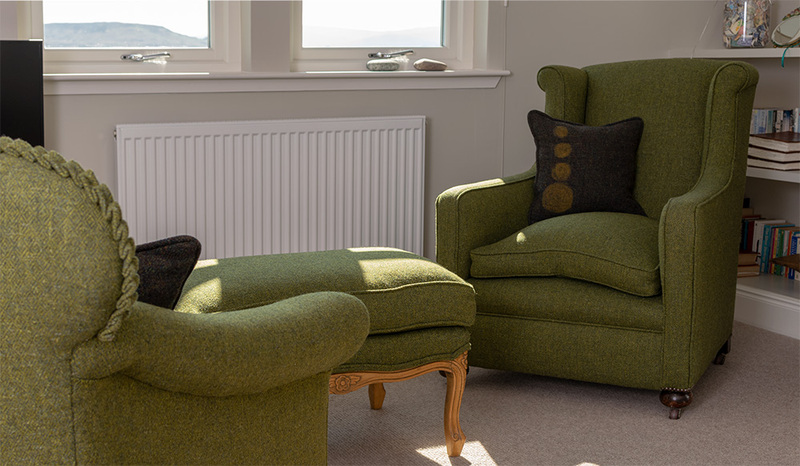 I was delighted to collaborate with Skye Weavers at this stage in my career as an upholsterer. 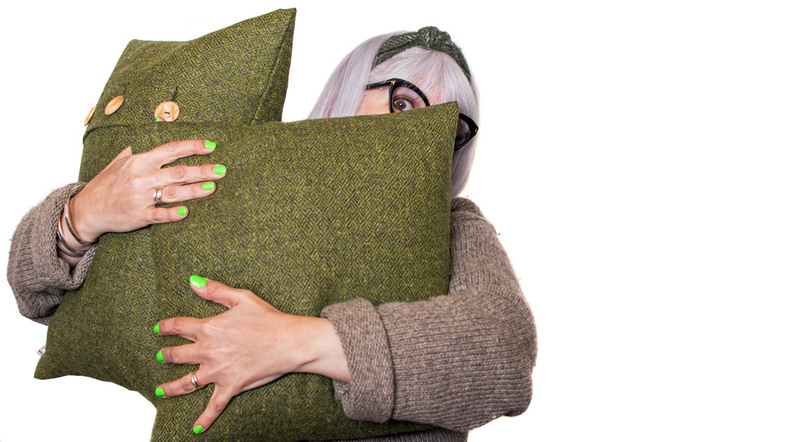 I enjoyed working with their tweed and look forward to future projects. Going forward, I plan to continue to develop the business locally, building relationships and, over the years, adapting my skills to use in car and marine upholstery. 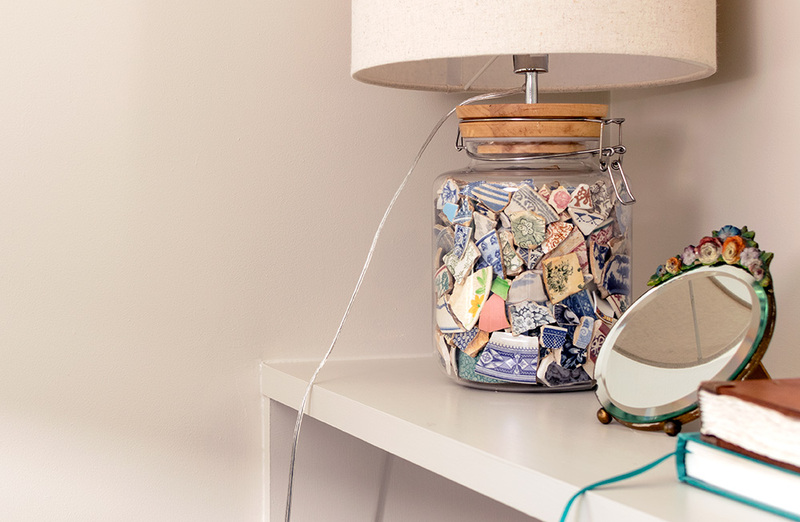 If you would like to discuss a project, please email a picture of the piece, together with a note of what you require. 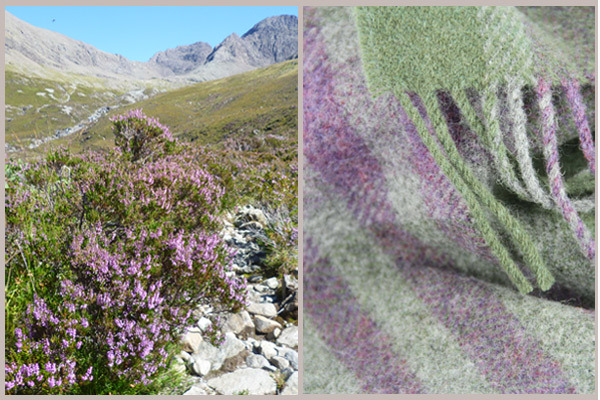 Our new range of asymmetric lambswool scarves was inspired by looking at Skye’s natural landscape in close-up. 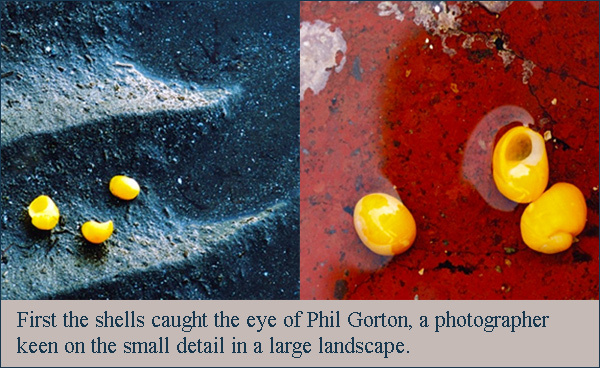 Phil Gorton is an analogue photographer who enjoys exploring the small and beautiful things around us as much as we do. With his unusual perspectives and close-up photography he manages to capture colourful moments, intriguing shapes and dramatic light effects even on the most grey and monotone days. 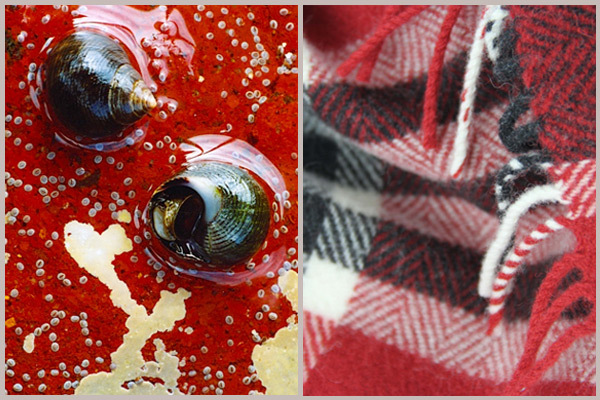 Two of our new scarves were inspired by Phil’s photography. 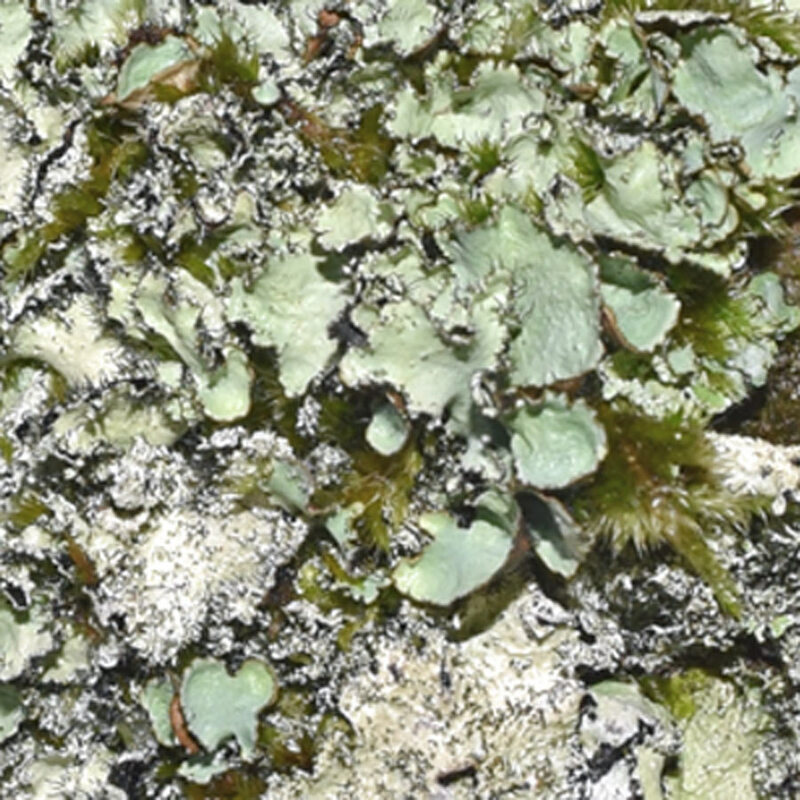 The first picture shows two Periwinkles rotating in a shallow rock pool near Cleat Skerry, on the shore of Loch Vatten, in the north west of Skye. The second picture was shot on the Pool Roag shoreline. 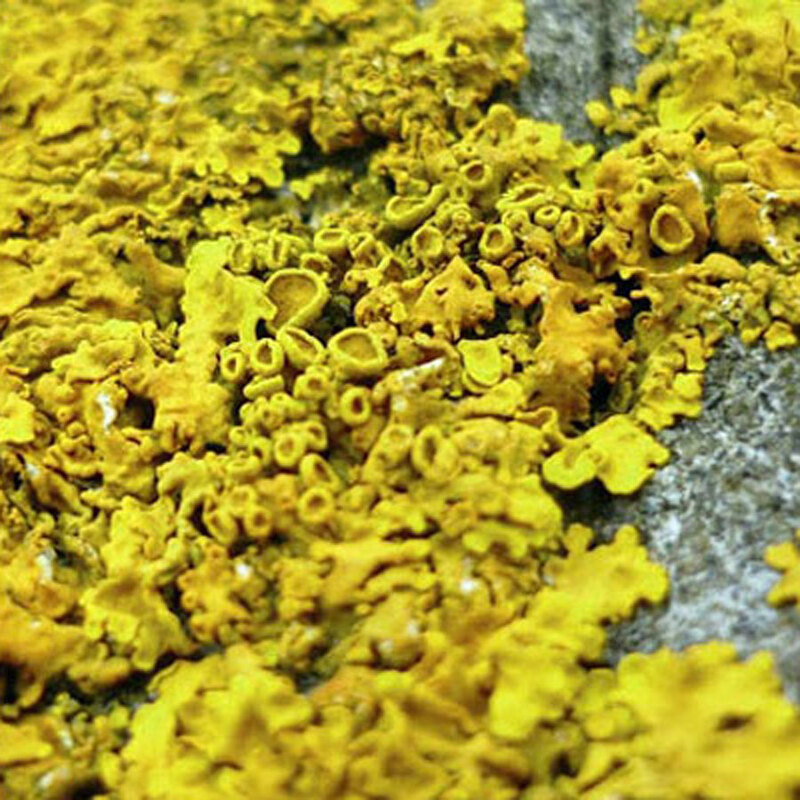 It shows a close-up of the bright yellow and white lichens which so often adorn rocks along Skye’s seashore. 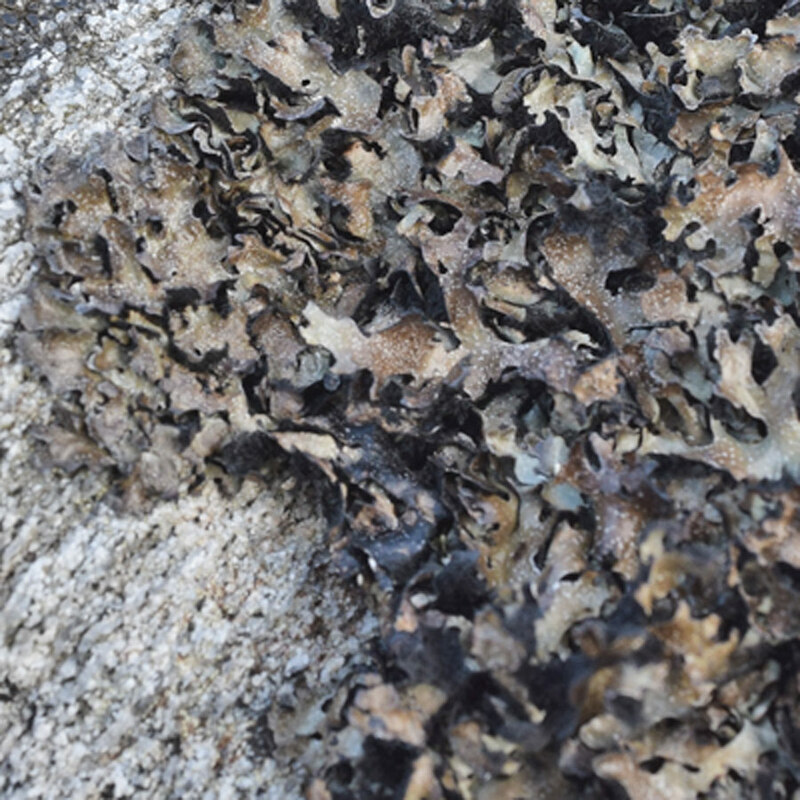 The third picture was taken by myself on a walk with Roger. It shows a rocky path meandering up into Coire a Ghreadaidh, one of the many scenic corries in the heart of the Cuillin Hills. You can buy the scarves in our online shop or directly from us in Glendale. Phil Gorton’s fine art photographic studio is about fifteen minutes away and we highly recommend a visit there. Can’t make it up here? 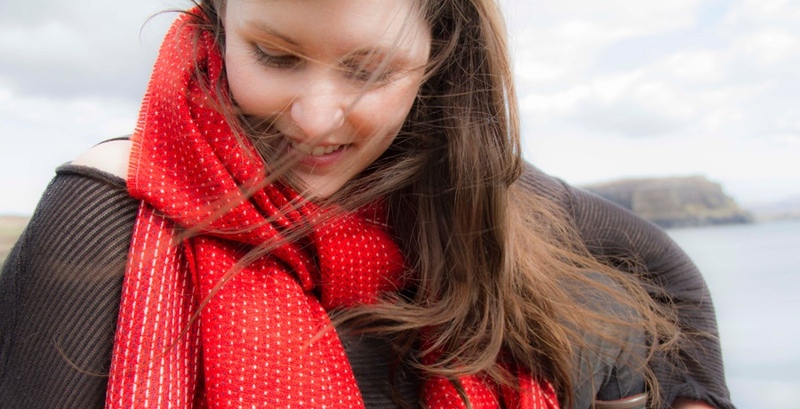 Contact Phil to get the scarf inspiration picture sent to you. 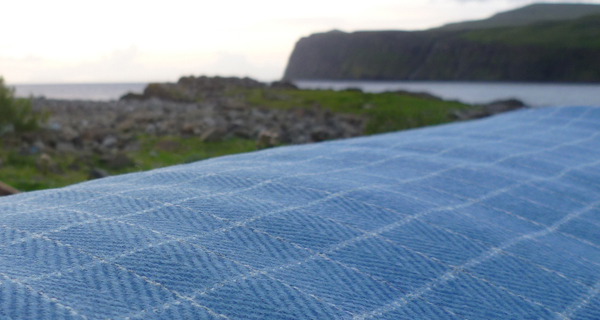 It is the quiet and misty days on the Isle of Skye that inspired our muted coloured variation on the traditional MacLeod Dress Tartan. Above are MacLeod’s Tables, enveloped in a wintery cloud. They are flat topped basalt hills of 489m and 469m height. On a clear day you can get fantastic views of the Cuillin Hills and the Outer Hebrides from the top. 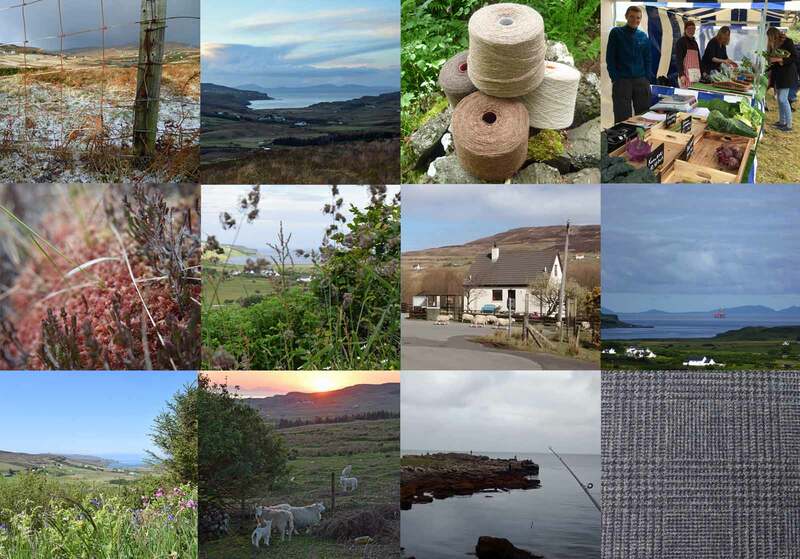 The history of the MacLeods on Skye goes back nearly eight centuries. 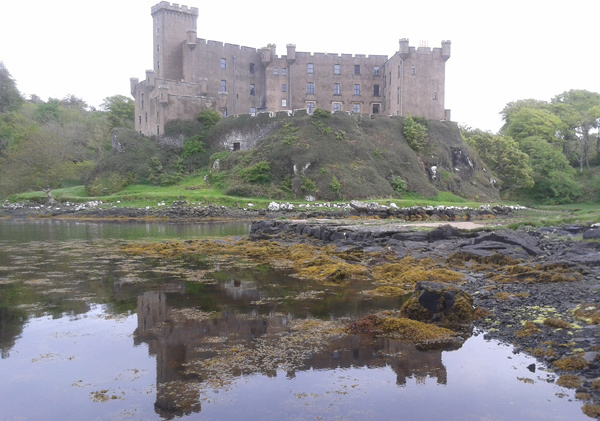 Dunvegan Castle, the ancestral home of the Chiefs of Clan MacLeod, is the oldest continuously inhabited castle in Scotland. 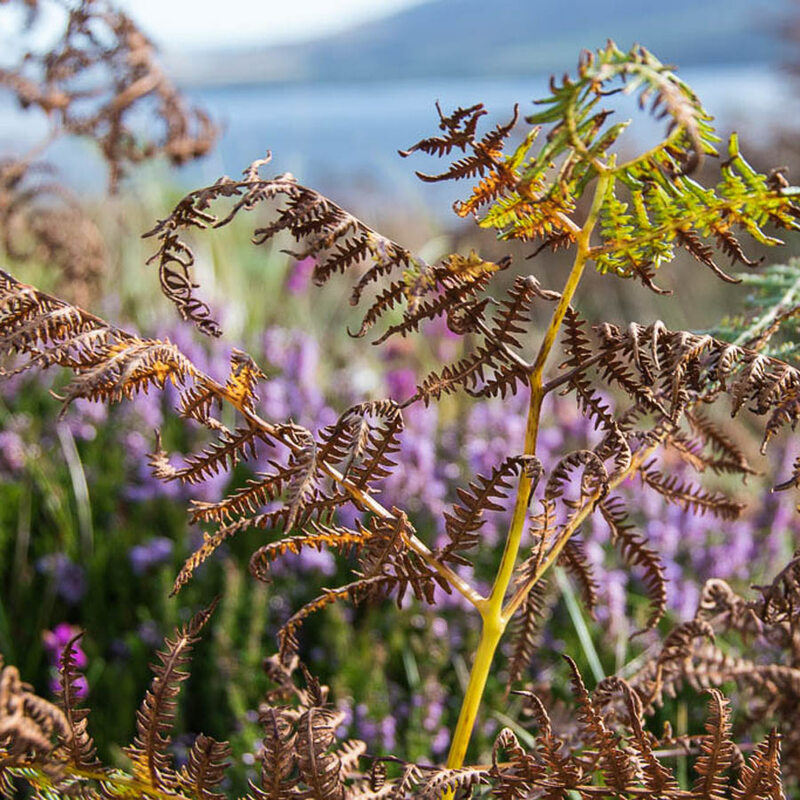 The picturesque setting on the edge of Loch Dunvegan, and the magnificent gardens surrounding the castle, make for a great day out in the north west of Skye. 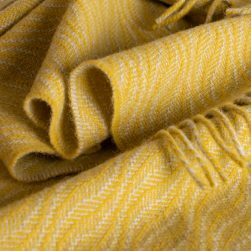 On our bicycle pedal-powered loom we wove soft Lambswool scarves and big cosy shawls, ideal to wrap up in as the Skye mist closes in. 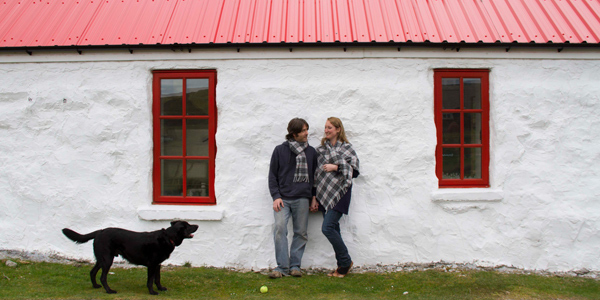 Below our shawls and scarves are modelled by Elly & Craig of the Red Roof Cafe Gallery, a great place to call in on your way to Neist Point Lighthouse. 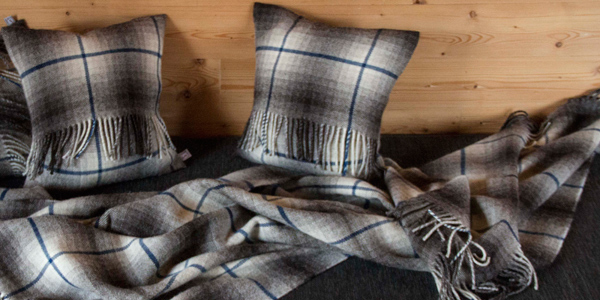 The Misty MacLeod Scarves and Shawls are now also available in our online shop. 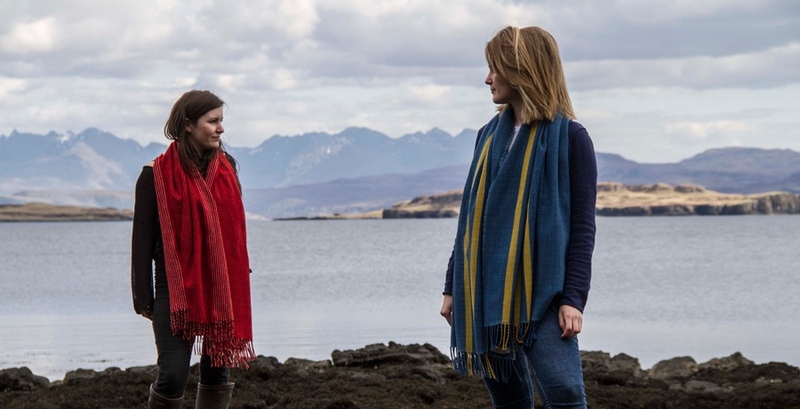 The photo shoot for our new Misty MacLeod Scarf and Shawl took place at the Red Roof Cafe Gallery, in perfect view of MacLeods Tables. 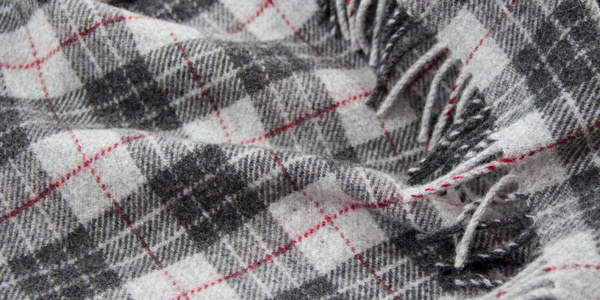 The pattern of scarf and shawl is based on the MacLeod Dress Tartan, but we wove our version of this traditional tartan in the soft grey colours of a quiet, cloudy day. It was on exactly this sort of day, that we took the photos. MacLoed’s Tables were well tucked away in the mist which gave the new neckwear its name. 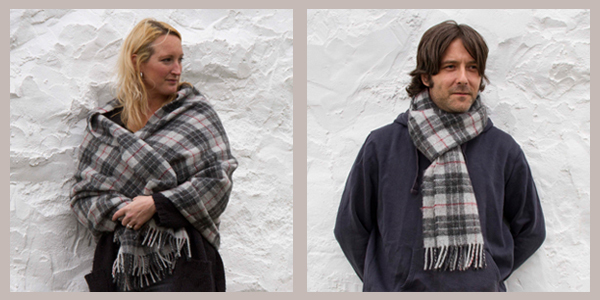 Elly and Craig modelling the Misty MacLeod Shawl and Scarf outside the Red Roof Cafe Gallery. Angus featuring as Angus the dog. The Red Roof Cafe Gallery might appear quite small on the outside, but it’s a tardis of great food and creativity. You can enjoy delicious home baking and freshly prepared lunches while looking at Elly’s dramatically colourful paintings and collages. On most Friday nights during summer the little cafe turns into a venue for world renowned musicians. 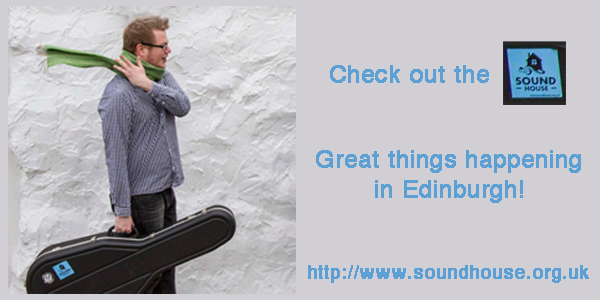 Check out this years gigs and book your tickets soon! 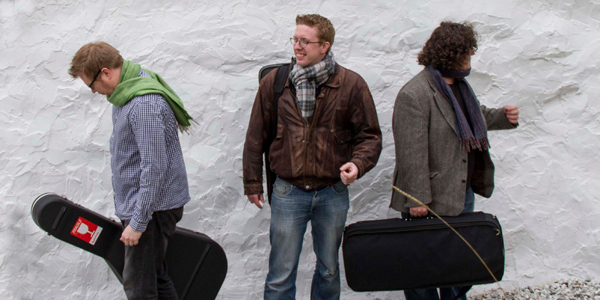 The day of our photo shoot saw the arrival of guitarist and flautist Tom Oakes, joined by Andy May on Piano and Uilleann/Northumbrian Pipes and Daniel Thorpe on the Fiddle. They were playing together as the Tom Oakes Experiment. Many thanks to them for the impromptu modelling and the great music afterwards! It has to be said though, that trying to direct musicians in a photo shoot is a challenging art form in itself. The Tom Oakes Experiment: Daniel, Tom and Andy performing in the Red Roof Cafe surrounded by Elly’s artwork. 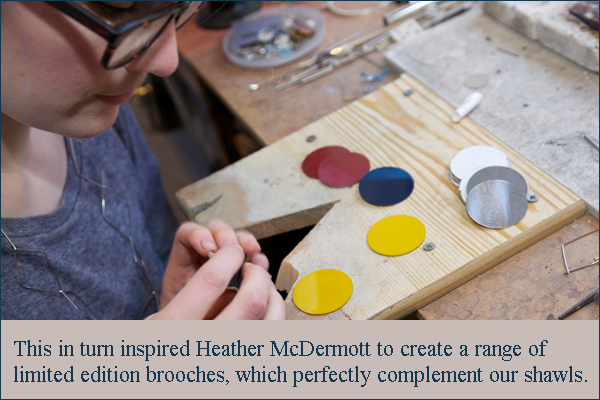 DEADLINE FOR COMPETITION ENTRIES: SUNDAY, 5TH OCTOBER! 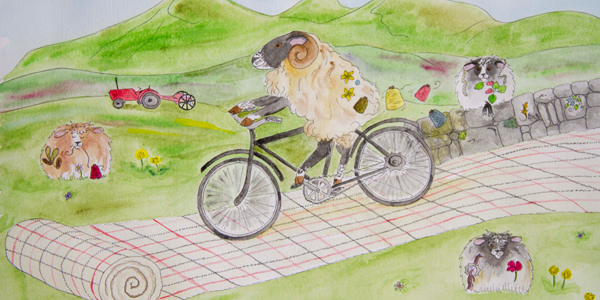 Do you love wool and enjoy riding a bike? 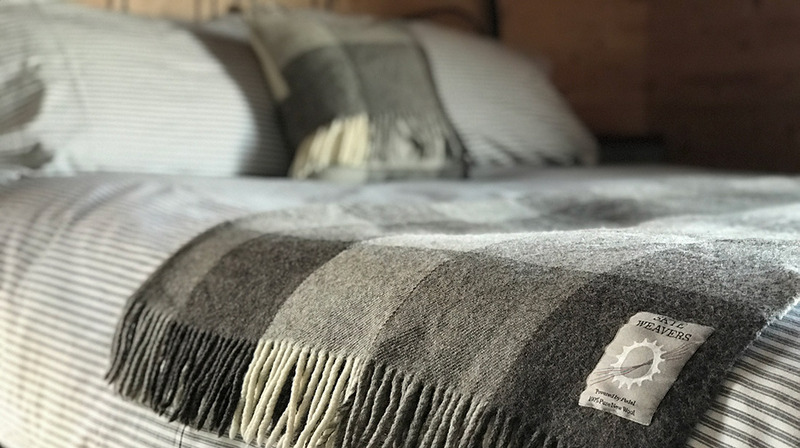 Then you’ve got the two perfect attributes for our Wool Cycle competition – and you could win a fantastic Skye Weavers prize! 1. Get somebody to take a photo of you on your bike, wearing something woollen. 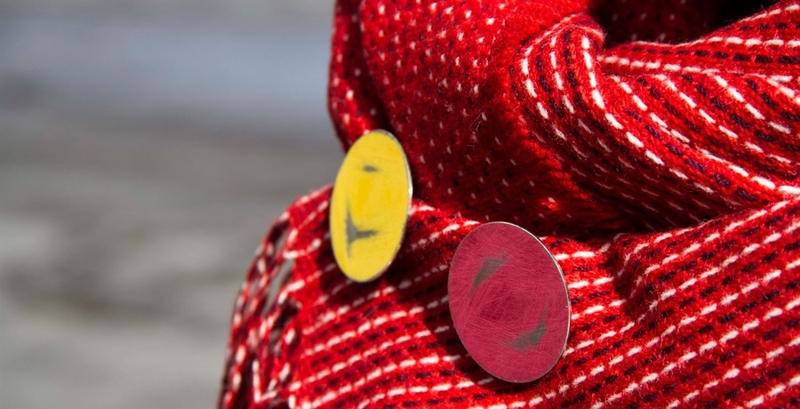 This could be anything from a scarf or a knitted jumper to tweed boots and a fancy woollen hat. 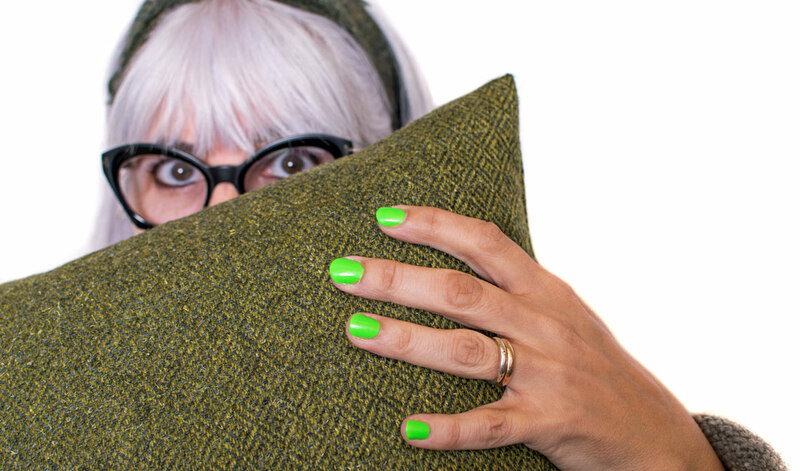 Let your imagination run wild and leave no doubt as to how much fun it is to be wearing wool! 2. 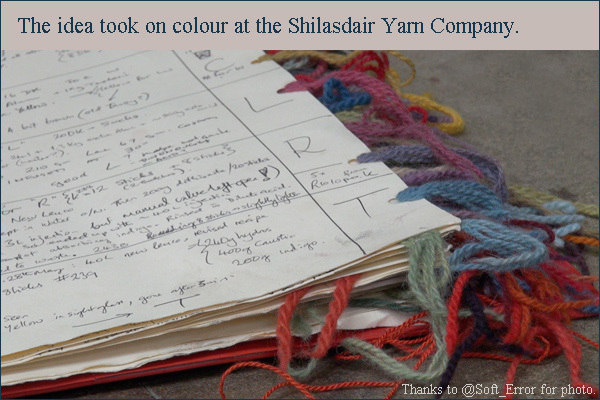 Send this picture to us via email or bring it along to our weaving shed on the Isle of Skye. You are welcome to include a brief caption. 3. 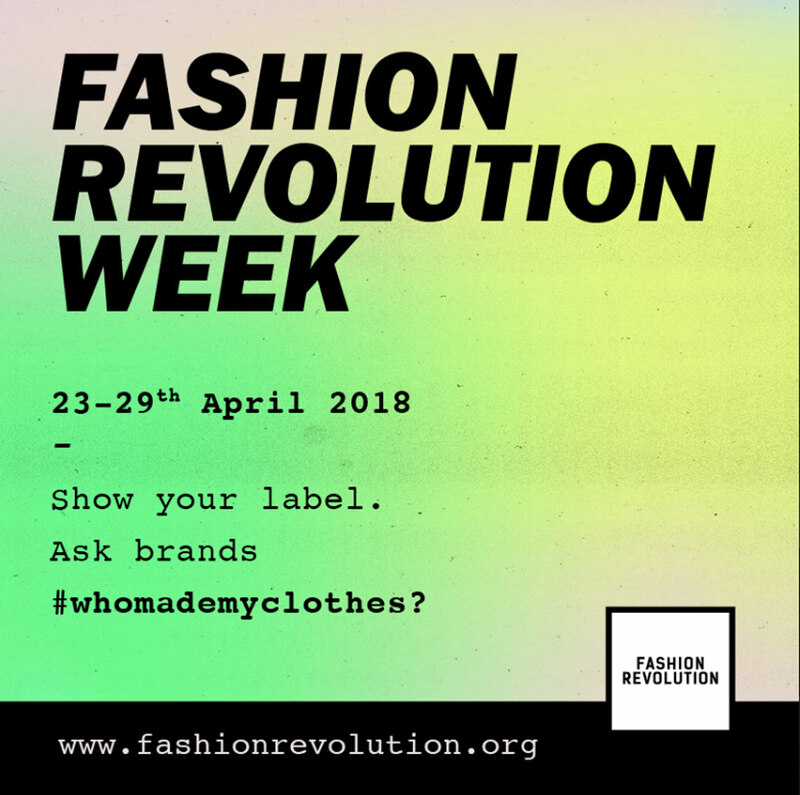 In the time leading up to the Campaign for Wool’s Wool Week (6th of October to 12th 2014), we will choose the best photos, which will go on the Wool Cycle shortlist and be featured on our website. 4. 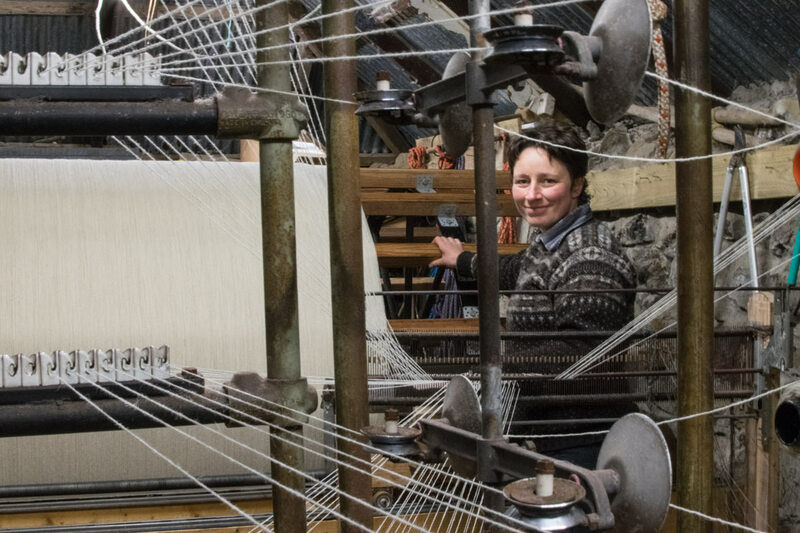 During Wool Week you will be able to vote for all shortlisted photos, either online or at our weaving shed. 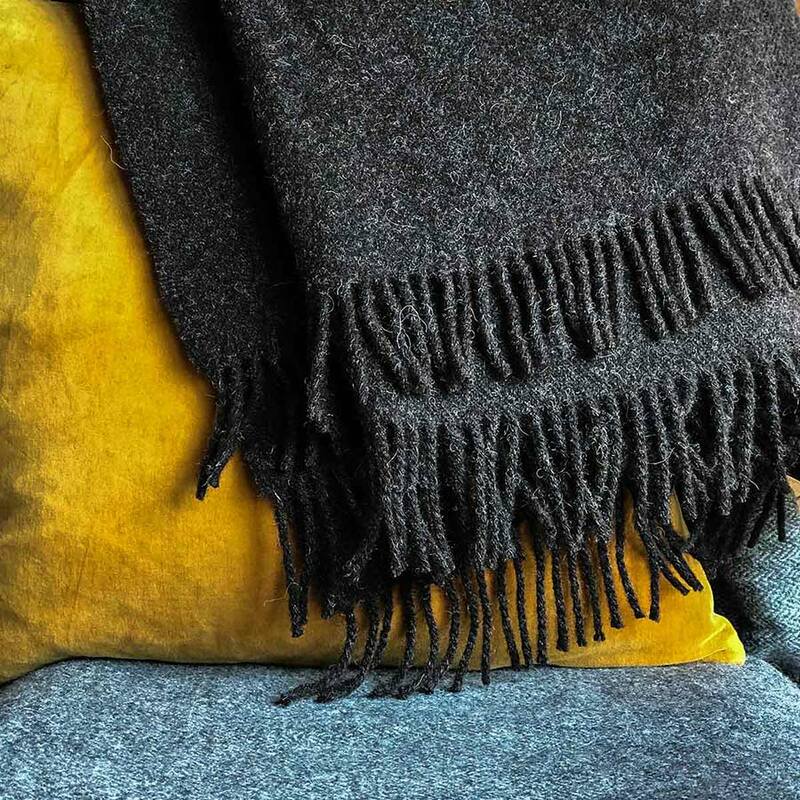 The picture with most votes wins a cosy Blue Hyla Throw and two Tassel Cushions, all woven on our bicycle pedal-powered loom! You, a bike and something woollen are in the picture. You can enter a maximum of 3 pictures. By sending us the picture/caption, you are giving us permission to publish them in connection with the competition (e.g. Facebook & Twitter). We won’t publish your personal details. 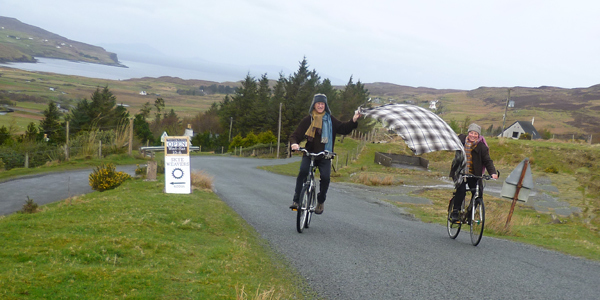 Get cycling in woollen style! We look forward to seeing your pictures! With best wishes from the pedal-loom.